Congratulations to Coach Kristen Mahoney and the team for their stellar season. It is the first league title for BHS in softball since Coach Mahoney pitched the squad to the championship back in 2002. We wish the team luck as they head into the Eastern Mass. Tournament this week. 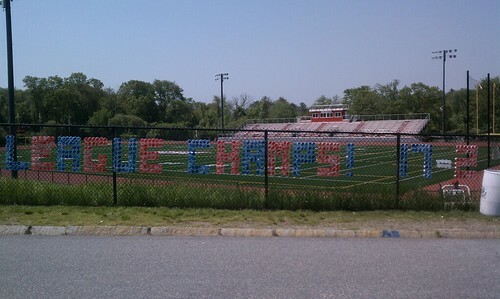 The fence at the entrance of BHS announces our softball championship. Congratulations, BHS Softball team and coaches!! You've done a phenomenal job and we're very proud of you!! What a great comeback! !